What WooCommerce Triggers and Actions are Supported? New Line Item in Order - Triggers for each line item in an order. Use this if you need the line item details from an order. New Order Status Change - Triggers every time a WooCommerce order changes status.See the Managing Orders documentation (https://docs.woothemes.com/document/managing-orders/) for more information on order statuses. Subscription Renewal Failed - Triggers when a subscription renewal payment fails.Only available when the WooCommerce Subscriptions extension is activated. New Order - Triggers when a WooCommerce order is paid for (order changes status to Processing). New Customer - Triggers if a customer chooses to register for an account. This can happen during the checkout process, or via the My Account page.Note: this trigger will only occur if your WooCommerce general settings have the "Allow registration on the checkout page" and/or "Allow registration on the My Account page" settings enabled. Subscription Created - Triggers when a subscription is created, either via the Checkout or via the REST API.Only available when the WooCommerce Subscriptions extension is activated. Subscription Status Changed - Advanced: triggers every time a subscription changes status. Consider using with a Filter.Only available when the WooCommerce Subscriptions extension is activated. 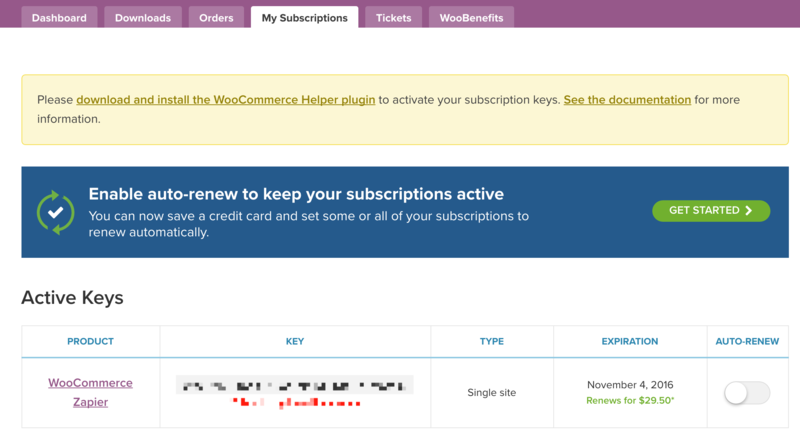 Subscription Renewal - Triggers when a subscription renewal payment completes successfully.Only available when the WooCommerce Subscriptions extension is activated. To install this plugin, go to: WordPress Admin > Plugins > Add New to upload the file you downloaded with Choose File. You can now start creating a New Zapier feed under your WooCommerce install. If you need more information, WooCommerce has written some great documentation about how to get started. You can find this documentation and more here. 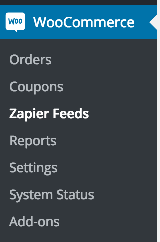 Once you've completed creating the WooCommerce Zapier feed, you can continue creating the Zap by setting up the Action template. When someone places an order, eg. an order with 3 items, your Zap will be triggered 3 times. Each trigger will contain details for a single item in the order. There is no inherent grouping of the line items between orders so you won't be able to do things like "Create an invoice inside of Freshbooks" but you could do something like "Insert line items into a spreadsheet" and do the accounting there. Inside WooCommerce, you'll want to use the "New Order" choice and inside Zapier the "New Line Item in Order" trigger. To use line items in Zapier, you'll usually want to ensure that both the trigger and the action you're using have line item support on Zapier. In Zapier's WooCommerce integration, the “New Order,” and “New Order Status Change” triggers offer line item support. If you'd like your Zap to iterate over each individual item in a product, you'll want to use the “New Line Item in Order” trigger. If you want to learn more about how line items work, read our Guide to Line Items here. If your site is in "Maintenance Mode" be sure to turn this off. This may block the connection between WooCommerce and Zapier. Upgrade to the latest version of the WooCommerce Zapier plugin. Use a different format for your webhook. So instead of https://hooks.zapier.com/hooks/catch/12345/abcde/ you can use https://zapier.com/hooks/catch/12345/abcde/. This should allow you to pass the validation check on the WooCommerce side and should still work. A bug was introduced to the WooCommerce plugin around August 2016. Upgrade to the latest WooCommerce Zapier plugin v1.6.3 to fix this. Make sure that both WooCommerce and the Zapier WooCommerce plugin are up to date. If you've got the right version, the cause is usually an issue of the WordPress site's built in cron facility not working reliably. The best course of action would be to go to https://woocommerce.com/my-account/create-a-ticket/ and submit a ticket so that WooCommerce can help directly. Orders are being sent to Zapier multiple times! Order Discounts aren’t being sent to Zapier!